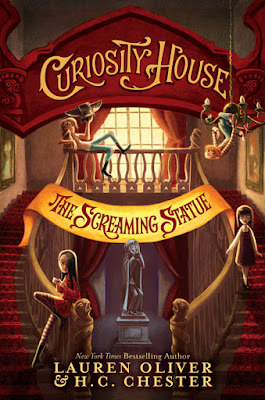 How lucky am I that my first, new, and shiny Kidliterati post is an interview with a talented author, her co-author, and a surprise character for the second book in the fantastical series, CURIOSITY HOUSE! Check out all of the wonderful, quirky, awesome that is this series and don't forget to enter the GIVEAWAY for copies of the books, a deck of cards, and a button! THE SCREAMING STATUE releases May 3rd, 2016! Four orphans with extraordinary abilities and questionable pasts—Pippa, Sam, Thomas, and Max—are happy to be out of harm’s way now that the notorious villain Nicholas Rattigan is halfway across the country in Chicago. But unfortunately their home, Dumfreys’s Dime Museum of Freaks, Oddities, and Wonders, is in danger of closing its doors forever. 1. What inspired you to write the Curiosity House stories? I was inspired by a series of old postcards--you can see them at www.thecuriosityhouse.com!---which prompted me to begin researching the dime museums that were so prevalent during the early decades of the last century. Many of the characters in the Curiosity House have their inspiration in real people. 2. What collections do you have or wish to one day have? Unlike Mr. Chester, I am not much of a collector--unless you count high heels! I do collect mugs, though, with funny sayings on them. I need a lot of extra help when I get up in the morning, and drinking coffee from a fun mug helps. 3. How was the experience of collaborating with Mr. Chester? Since he rarely leaves home, did you work mainly over the phone? Through letter writing? Email? Initially, Mr. Chester had neither email nor a working telephone (he was surprised to learn that his phone had been disconnected back in 1984), but we wrote letters and did a lot of in-person visits. I at last prevailed on him--miraculously--to get an iPhone, but only by pointing out he could use it to take lots of pictures of his dog, Trudy. 4. I've heard you hate bananas. What is your favorite meal? Pasta, pasta, more pasta! I could eat pasta for every meal. Gross but true: for a real, throwback, comfort-food meal, I will eat plain pasta with ketchup on it, or pasta with butter, hot sauce, and parmesan. Yum! 1. I've heard you prefer to be indoors and rarely leave your home. What hobbies, other than collecting, do you enjoy? I must take issue with the very premise of your question. Collecting is not a "hobby" for me. It is my life's work. My collection of ancient Assyrian pottery shards, for example, is recognized by ancient Assyrian pottery shard scholars both here and abroad as, perhaps, the finest in existence. My pursuit of such treasures leaves little time for hobbies, though, in my rare hours of leisure, I enjoy assembling jigsaw puzzles with my companion, Trudy. 2. Is there anything you haven't yet acquired for your collection that you're desperate to find? As I am sure you aware, I possess what is arguably the world's largest collection of stuffed Peruvian fruit bats and, for many years, have served as president of the Stuffed Peruvian Fruit Bat Association of America. Among my fellow members of the SPFBAA, rumors have long circulated that there exists in the deepest recesses of the Peruvian jungles a giant albino fruit bat that we have nicknamed, with the rollicking humor for which we are renowned, "Moby Bat." It goes without saying that obtaining such a specimen would be the apex of my collecting career. 3. Since you keep minimal social interactions with the outside world, how was your experience collaborating with Ms. Oliver? My collaboration with Ms. Oliver was exceedingly pleasant, particularly since it was largely conducted through postal correspondence and thus necessitated only the smallest degree of human interaction, which, as you observe, is something I prefer to avoid as much as possible, my emotional needs being more than fulfilled by my companion, Trudy . 4. I read your mother was an... adventurous cook, particularly her canned-tuna-and-fruit-cocktail casserole. What is your favorite meal? You must keep in mind that, while planning my weekly menus, I must take into account not only my own culinary desires but those of my regular dining companion, Trudy, who has a marked preference for dishes composed primarily of squirrel meat. I must say in all modesty that my "Casserole de Squirrel avec Sautéed Kibble Bits" is unsurpassed. 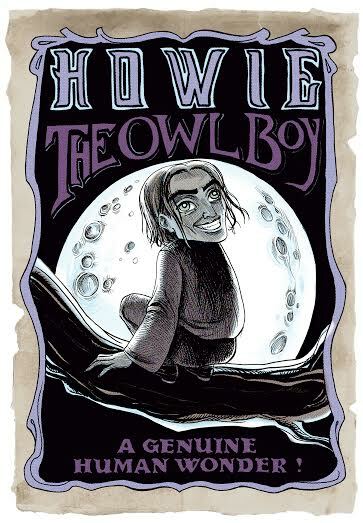 With his brighter-than-the-sun smile, perfect hair, and enormous eyelashes, Howie looks more like a model than a freak…until he swivels his head around 180 degrees to check his back for Kick Me signs. 1. When did you first discover your unusual talent? All the members of my family were, thankfully, born with one of several "odd" features of their neck and spines. For example, my cousin Virginia is a world-famous contortionist (and, I have to say, much better than Thomas). Both my parents can rotate their heads as I can, which made it extremely difficult to sneak cookies behind their backs. 2. Must you do certain stretches or exercises to keep your neck limber? I begin every day with a series of head-rolling exercises, taught to me by my uncle, the famous Hawk-Eyed Hank, who once served as secret service for the president. 3. Do you ever use your talent for practical jokes? Of course not. My natural talents are no laughing matter. 4. Do you collect any interesting trinkets or items like Mr. Chester? I wouldn't call them "trinkets," but I do keep correspondence from some of my many famous admirers, including heads of state, movie actresses, and the man who invented the cereal box. 5. Owls are known for feasting on mice, rats, squirrels, opossums, woodchucks, bats, and weasels, among other things. What is your favorite meal? Steak, very rare. And a glass of milk over ice. Thanks for this amazing chance! I've read most of Lauren's books (childrens, teens, and her adult book) and have loved them all. It would be amazing to have these books... Fingers crossed! Great post. I've read most of Lauren's books and have loved them all.